The Parish of Thurlestone takes its name from the big arch shaped rock jutting out from the sea off Thurlestone Sands. It is thought that the name comes from the Anglo Saxon word “Thirl”, (also Thurl or Thorl), which means nostril or small hole, and “Stan” meaning stone. In the Domesday Book of 1086, Thurlestone was written as Torlestan. In various other old documents it has appeared as Torleston, Thorleston, Thurleston and finally the Thurlestone that we all know today. 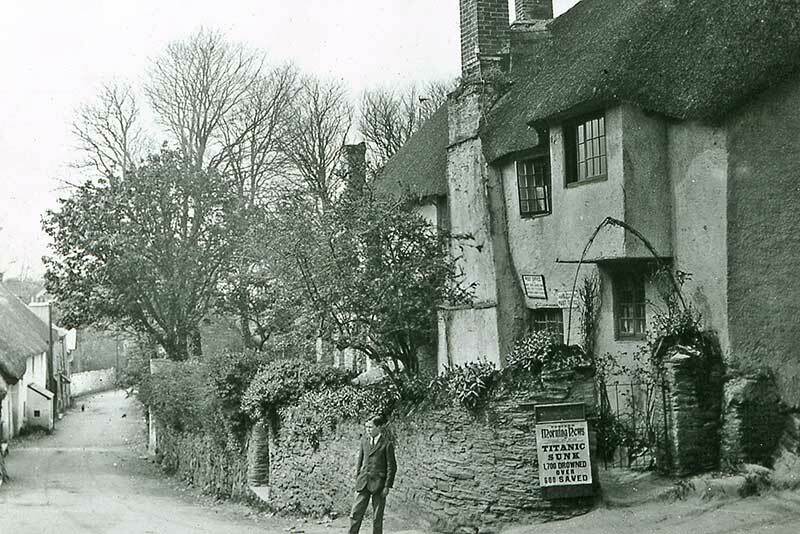 A priest at Totnes, at around the same time as the Domesday survey, even wrote it as Turlestagnum or “Stagnant Pool”! It is thought that he was thinking of the marshy ground behind Leas Foot, or the Ley behind Thurlestone Sands (also known as South Milton Sands). 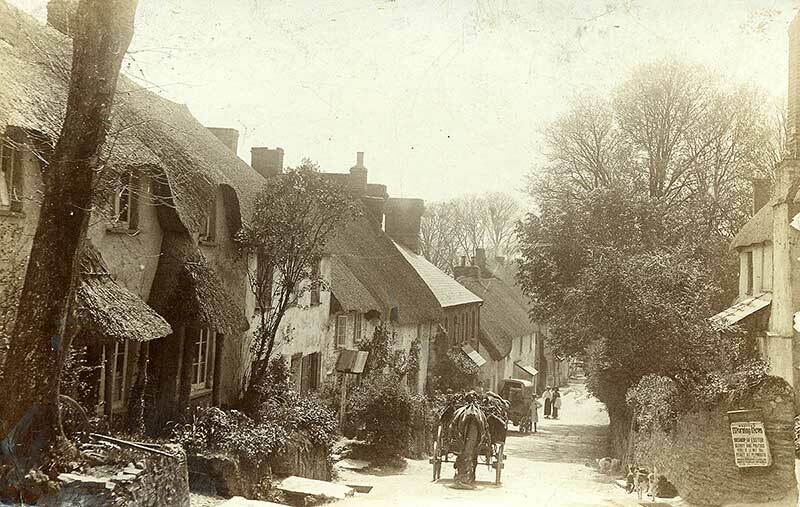 In the Domesday Book, Thurlestone was described as a manor of 240 acres, with a population of 35 people, a church, a farm and a few cottages for the labourers. Thurlestone manor itself was given to Judhel, one of William the Conqueror’s army commanders as part of his reward for the conquest of southern Britain in 1068. In the 1700’s the beaches around Thurlestone were used for smuggling. Apparently, more rum and brandy were smuggled into Devon and Cornwall in this era than arrived legally into the whole of the Port of London! The church porch roof was a handy store for the hidden contraband! The original church, built around 1042, was probably built of cob and had a thatched roof. In 1230, a stone built church was recorded in its present location. In the early 1400’s, the top part of the tower was removed and the tall tower of today was put on the original base. The church was extended during the next century. In 1848 the tower had listed badly to the east, so the then Rector, the Reverend Peregrine Ilbert, (Rector from 1839 -1895), insisted that the churchwardens borrowed £120 to get it repaired. Local stone masons removed the top section and rebuilt it, putting the weight back towards the west. You can still see the kink to this day! The church has six bells, the oldest dating from 1654. The clock was put there in 1945 in memory of a churchwarden. The main street still has many old cottages dating from the 17th century. They are built of stone, cob and also wattle and daub. One of them, Cradles Cottage, was built in about 1705, and in the 1800’s was used as the village shop run by a Mrs Susan Pound. The farm mentioned in the Domesday Book, was, by the 1700’s, mainly a sheep farm and had spread to both sides of the road. Opposite the church was the main farmhouse, gardens, courts, orchards and a granary. Next to the church, were more barns, shippons (cattle sheds) and linhays (outbuildings). This area has changed a lot over the years and now has private housing and also, since 1999, the Village Shop/Post office. The Village Inn, which is owned by the hotel, occupies part of the farm’s 18th century granary building. The building also contains timbers which were salvaged from boats wrecked along the coast during the Spanish Armada. The oldest surviving building in Thurlestone, excluding the church, is Church House, near The Old Rectory. Permission to build this house was given in 1536 by the Rector Richard Worth, who gave the plot of land to the villagers as a place of their own so that any drunken revelry was kept out of the church. Similar church houses were built in many villages at that time. Today, the original Church House is divided into private homes. Pearse’s Farthing is another of the oldest buildings in Thurlestone and is thought originally to have been a farm. 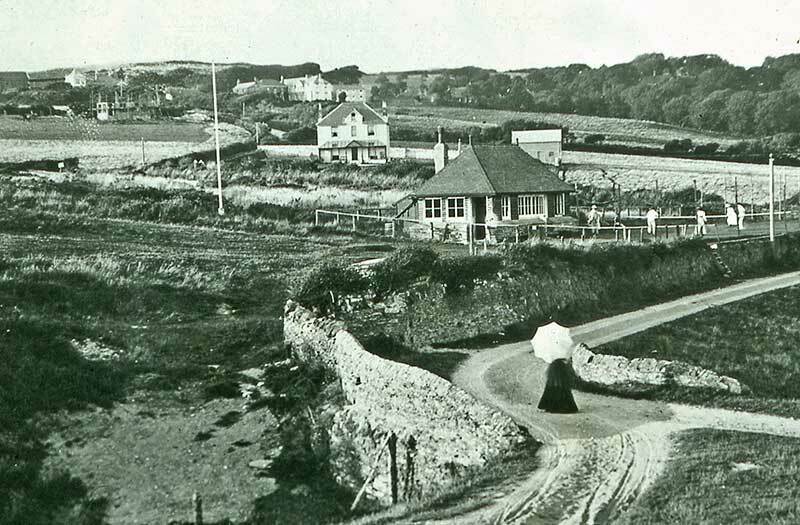 It’s location on the corner of the main street and the road to Buckland (Rockhill Corner) could be a reason why the village grew up the hill away from the church, rather than down towards the sea. It was also the building that once housed the village Post Office. In olden days, if you didn’t have your own well, water would have to be fetched from the village well, part way down the main street. Originally, it was a simple well with a rope and bucket. In 1834, a pump with a long iron handle was put in. A little house with iron railings and a gate was built around it to protect it. Water would be fetched using wooden shoulder yokes which carried two buckets at a time. In 1948, the pump was taken away and the well was sealed over. In October 1995, money was raised by local villagers to restore the pump house to its present state. ​The original Rectory was built by the Rev. Peregrine Ilbert in 1836, prior to him taking over as Rector, to accommodate his wife and their seven sons and two daughters. A keen DIY man, he also converted a barn further up the main street into their retirement home – known today as Rockhill. The current “Old Rectory” was built in the 1930’s on the site of the original Rectory, and is now private housing. Thurlestone Parish School was also founded by the Rev. 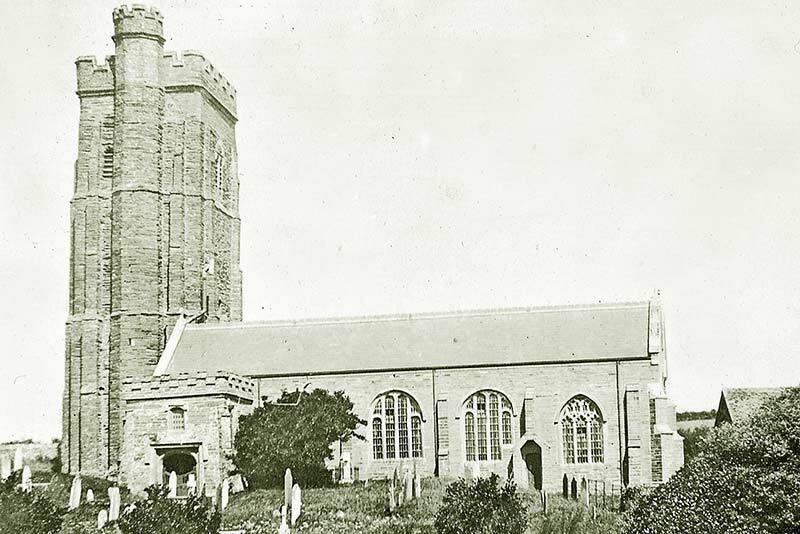 Ilbert, in 1842, and was housed in a small thatched building near the church. In 1903, it moved to its current site. Parts of the original Victorian building still exist, and a bust of Queen Victoria can be seen high up on the front of the school. The school was extended in 1974 when it combined up with South Milton School. 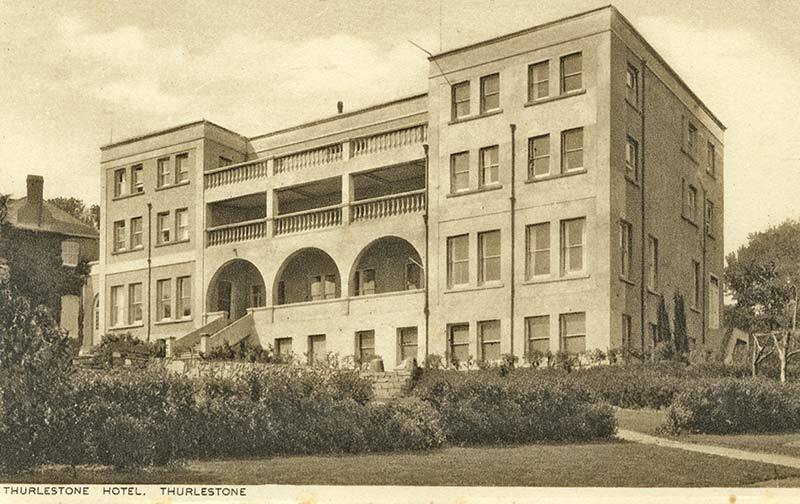 ​The Thurlestone Hotel has been owned by the Grose family for over a century, and opened as a hotel in 1897. Originally built in the 1700’s as a farmhouse, it has kept part of the original building in the front reception area, and is now much bigger and more luxurious. William John Grose and his wife Margaret Amelia were originally farmers, and moved to Thurlestone from Court Barton in 1897. They decided to convert the farmhouse into a small hotel called Thurlestone House, and give up farming. This proved to be a great success, as people using the newly-formed golf club, had somewhere to stay that was near to the course. The golf club, also founded in 1897, was built on land called the Warren. In Norman times, rabbits were bred here for their fur as well as for food. Rabbits only really became wild in the last 200 or so years. The golf course was originally nine holes, but this was extended in 1912 to eighteen. The golf club also opened a tennis court in 1900, which became so popular that four more courts soon followed! The War Memorial was erected on the village green in front of the church in 1920. The Yarmer Estate has properties that date from the late 1800’s and grew due to the popularity of the nearby golf course. The estate expanded significantly in the 1960’s, and today many of these houses have been modernised or even rebuilt, and are now used mainly as second homes. ​The Mead Estate came into being in 1968 when the first of the 125 houses planned for the estate were built. Now it is a well-established estate made up of a mixture of bungalows and houses. The Links Hotel was built just before the start of the WW1 and owned by Sir Joshua Boyd. It never really thrived and the Grose family bought it in 1950. After many problems, they in turn sold it in 1972. It was then converted into luxury apartments. ​Article contributed by Alison Bone. Information taken, with permission, from the book “The Story of Thurlestone, Bantham and West Buckland” by Kendall McDonald. Photographs from the Peter Hurrell collection and Janet Fraser - click on photos to enlarge them.